I am simply sharing what our experience has been of late, where I have sourced some valuable tips from and what has been working (and not working) for us. Let’s rewind approx a month or so ago and I can honestly say I had a great little sleeper (generally). As many of you know we do get up at the crack of dawn everyday 5 or 5.30 or a generous sleep in until 5.45 😂 but it has been that way with Aria from day one. Shaun and I are early birds as he is up for work early each day so it’s just something we have adjusted to and that’s how we roll. In saying that Aria has always been the baby that has gone to bed between 6-7pm without a fuss and often even has asked to go to bed on her own. We had a relatively routine day nap thing going on too. So yeh I would say as far as babies/toddlers sleep goes all was pretty good. Then in the weeks approaching her second birthday let’s just say all that went out the window. Bed time and nap time became a nightmare and I often dreaded it. A month or so later and we are still on a roller coaster but slowly getting there. We decided to put miss Aria into a big bed (single) and out of her cot for two reasons. 1) we wanted to tackle the transition before the baby arrives and 2) she seemed to have developed a bit of a fear or dislike of the cot so we felt it was time. The weeks prior to setting up her bed I found myself up several times a night resettling Ari and being 8months pregnant found this was exhausting especially when she needed cuddles or to be rocked because let’s face it there was no way I was going to squeeze into that cot and a 12kg babe on top of a growing baby bump isn’t so easy. We often ended up on the couch almost asleep but not really which then resulted in a super tired toddler and mama the next day. It’s been two weeks since setting up her bed and it’s been a roller coaster ever since. Throw in some teething, a cough and cold and just the change in general and I can’t say I’m surprised. Realistically I had given us 8 weeks before bubs arrives to sort ourselves out and was not expecting anything less. We are a work in progress. I found the toddler transition blog @bybrittanynoonan really helpful. I definitely recommend having a read of her helpful post and you can find the link here. 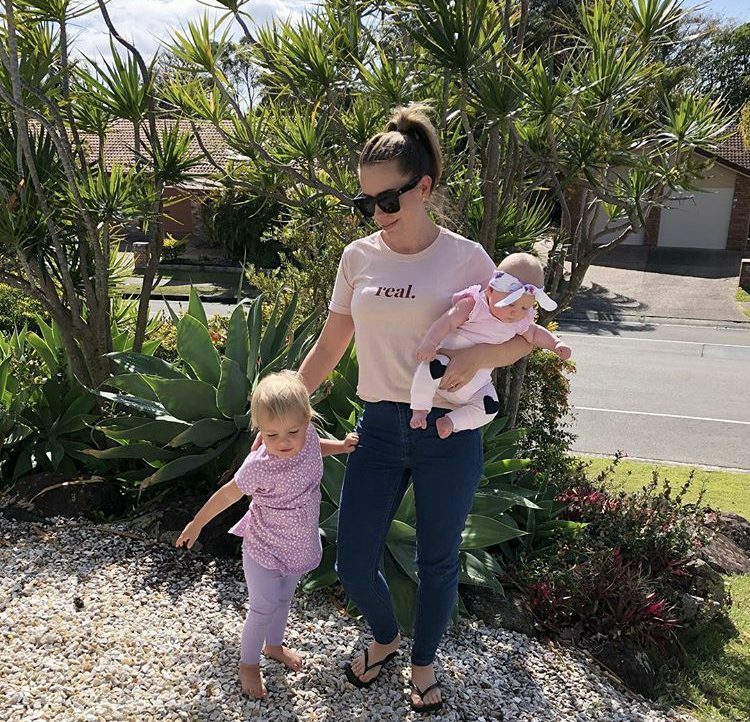 I actually re read daily for those first few days to keep fresh in my head all the different things that worked for other mums and Britt and then we just found what helped us make things a little less stressful and we are day by day getting there. There is no right or wrong way to approach it you have to combine your mama instinct with what tips are suitable for your household and go from there and be prepared for things NOT to go to plan lol. So here it is…. how we have tackled the transition and what’s working for us. The good old days of just popping Aria in her cot and her nodding off to sleep are gone (for now). I learnt that pretty quickly! I have had two nights where I have been able to put her to bed and walk out no drama other wise there has been lots of tears and now she can get up out of bed head over turn the lights on and fan up full blast and bang on the door (she can’t open her own door just yet 😅). So because of this I have chosen to lay with her until she goes to sleep. At first she slept with one eye open and if I scratched my head she would pop up thinking I was leaving and we would be back to square one. With the exception of some bad days we have seen progress with each day she doesn’t need me for as long and I can more or less walk out when she is almost asleep or drifting off without a fuss. Night wakings 😩 again this was never really a problem for us besides the early mornings but I am was seeing around 2-3 wakings a night now where she cries out and at first would get up and turn the lights on. Again day by day we are seeing progress with the crying turning into more of a call out and she doesn’t get up out of bed now. I do go back in and lay with her and she generally falls back to sleep in a few mins and I then leave the room again. Today was the first day in 2 weeks she didn’t wake up at 4am 🙌🏻🙌🏻 this early morning waking time was the only exception where I would just stay in there as I wanted to keep her in bed as long as possible and was trying not to stay in there so she would get used to waking alone again and let’s face it I’m bloody tired by this stage and yes I am guilty for slipping up and falling asleep in there with her but Again this was the option suited best for ‘us’ at this stage. * Keep your usual bedtime routine running as much as you can. I know with Aria she knows each step before it’s bed time. Sometimes it will run smooth sometimes it won’t. That’s ok! * Keep a night light on so if they do get up they can see where they are and not panic. * Keep your babes room as a sleep zone (no toys or distractions) just sleep toys. * Talk to your mama friends and share your sleep stories lol it’s actually comforting to know your all in it together. * There is no one fits all solution. Try what you are comfortable with and use your mama instinct. * Give yourself a realistic time frame to achieve the transition. It’s a huge change for everyone and it won’t happen over night. Especially now they can walk and wander! Weeks? Months? I’m not sure yet haha we are just seeing what happens. * Be prepared for sleepovers in your babes room or vice versa. * Don’t worry if your not doing things the ‘right way’ just do things ‘your way’. * Lap up those extra cuddles 🤗 they grow so fast.